The Dakota Access Pipeline will not create jobs or energy independence. What’s to Gain From Building the Dakota Access Pipeline? Profit. It won’t help us gain energy independence or even jobs. It’ll just make money for the people invested (including President-elect Trump). 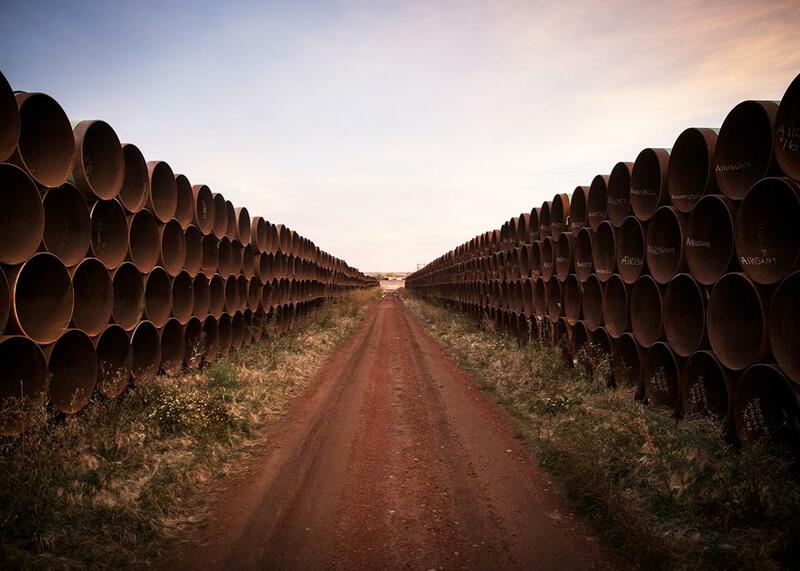 Miles of unused pipe prepared for the proposed Keystone XL pipeline sit in a lot in October 2014 outside Gascoyne, North Dakota. This story originally appeared on High Country News and is reprinted here with permission via Climate Desk. High Country News has reported what’s at stake for the Standing Rock Sioux tribal members and their allies trying to stop or re-route the project: tribal sovereignty, water, environmental justice, holy lands, treaty rights, and antiquities. Add to that the prospect of more carbon spewing into the atmosphere, and one can see why activists are risking so much to stand in the pipeline’s way. Once oil is flowing, property tax revenues—an estimated total of $55 million annually—will kick in. While it’s a big chunk of change, the impacts will be diffused, shared by four states. North Dakota and South Dakota are expected to receive about $13 million each, divided between several counties, a drop in the budget bucket. (Colorado generates nearly $20 million per month from taxes and fees on marijuana.) That said, it might be enough to buy the county sheriffs some more military gear from the Pentagon in order to squelch the next pipeline protest. It will not, however, cover the costs of such squelching: The current law enforcement effort has reportedly cost $15 million so far. The fact is pipelines, like transmission lines, don’t have a major economic impact except when they’re built. They otherwise go mostly unnoticed until they spill, burst, or explode. The bigger-picture impact, whether on climate change or energy independence, is more difficult to suss out. Both proponents and opponents seem to be working on the “build-it-and-they’ll-fill-it” premise. That is, if you expand pipeline capacity for North Dakota crude, it will encourage more oil drilling and thus more oil production. If more domestic oil is produced, the logic goes, then we have less need to import foreign oil and we achieve greater energy independence. The flip side to that is the more oil we drill, the more we consume, resulting in greater carbon emissions. This formula, however, holds only if lack of pipeline capacity is a major hindrance to oil development. It’s not. We can move crude oil not only through pipelines but also with trucks, trains, and tankers. Oil’s mobility (along with its relative fungibility) help make it a global commodity in a way that natural gas, for example, is not. 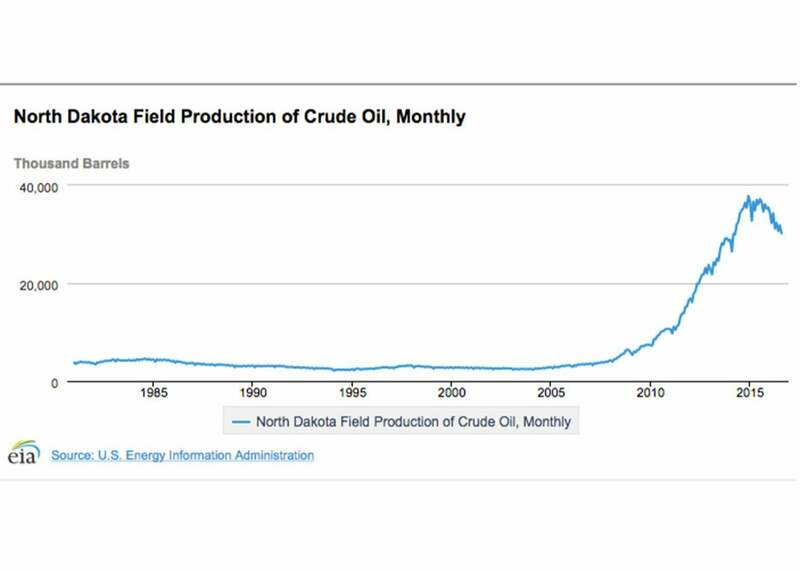 The lack of pipeline capacity is not a major limiting factor in oil development and production; when the North Dakota boom was on, no one opted out of drilling because of a lack of transportation options. In fact, prices were so high, no one opted out of drilling at all. Very few wells have been “shut-in” or plugged up. Most of the already-drilled wells continue to produce but at lower and lower rates, a phenomenon known as the “decline curve.” Wells that produced 220 barrels per day when they were drilled in 2005, for example, now only produce about 20 barrels per day. When these critical factors—global supply versus demand and price—into the aforementioned formula, the outcome becomes far murkier. No longer does more pipeline capacity directly lead to more production; it must first either raise the price of oil, or induce demand. The latter’s not going to happen. A pipeline across the upper Midwest will not inspire the masses in China to buy cars and drive them all over the country. It will not affect global demand. So how about price? The Dakota Access Pipeline is expected to carry a half-million barrels of oil per day to refineries and market hubs in Illinois. Moving a barrel of oil on the pipeline is expected to cost about $8, compared to approximately $15 for shipping it via rail. That is, if the producer would have received $34 per barrel for rail-shipped oil, it will get $41 per barrel for Dakota Access Pipeline–shipped oil. This $7-per-barrel bonus could add up to hundreds of thousands of dollars in additional revenue for the producer over the well’s life and could certainly keep wells from being shut-in. Yet it’s doubtful that it’s enough to push the producer to dust off the rigs and start drilling again. It costs anywhere from $5 million to $15 million to drill a well in North Dakota’s Bakken formation. After the last bust, producers and their investors are unlikely to fork out that kind of cash until oil prices go up considerably and stay there, which will only happen if Saudi Arabia commits to a long-term slash in its production. Unless new wells are drilled in North Dakota at a furious rate, production will continue to decrease, thanks to the decline curve. There is one other way the pipeline could impact oil prices, at least for the oil flowing through the line. Some oil customers reportedly entered into contracts with producers prior to construction to buy DAPL oil at or near 2014 prices. If those contracts remain in place despite the protests-caused construction delay, it could, theoretically, push producers to drill a few more wells to produce enough oil to fetch the higher price. But probably not. It’s more likely that those producers will simply divert oil now shipped by rail to the pipeline, thus increasing profit without increasing production. If, somehow, the pipeline was able to increase oil production, then we’d still have another variable to plug into our equation. I’ll call it the T. Greg Merrion factor, for the New Mexico oil executive who told me about it: “Nothing helps low prices like low prices, and nothing hurts high prices like high prices.” That is, the increased supply delivered by the pipeline (without a consequent increase in demand) would increase the amount of oil supply on a market where demand can’t keep up with supply. The glut grows. Prices slide further downward. There’s even less drilling. Production slides. The cycle continues. Which is to say the pipeline will be neither the economic boon, nor the climate bane, it’s been made out to be. Nor will it get the U.S. any closer to energy independence. Why, then, is Energy Transfer Partners so intent on building this thing? The equation that answers that one is far simpler. If the pipeline indeed carries 470,000 barrels per day, at a rate of $8 per barrel, the company should gross about $1.37 billion per year. Operating costs are low (remember, there are just 40 employees running this thing), so it shouldn’t take long to recoup the capital costs. That leaves a lot for the investors, like Energy Transfer Partners’ billionaire CEO Kelcy Warren, or reputed billionaire and President-elect Donald Trump.